While scouring Greenbelt 3 in Makati for a place to eat, “Marciano’s” cozy ambiance with its New York-Italian atmosphere caught our eye. Little did we know that our simple, impromptu visit would be laden with a few disappointments (I’ll get to that in a bit). Servings have sharing portions (good for two) which pretty much justifies their prices. Being that it was our first visit, naturally we asked what the specialties were. Upon inquiring and after carefully perusing the menu, we ordered what was supposed to be some of their bestsellers – 1 order of Serendipity Seafood Marinara Pasta (Php358.00) and an order of Letterman Mushroom Pizza (Php338.00). Their Serendipity Seafood Marinara Pasta had big chunks of shrimp. It was also loaded with mussels, lots of green and black olives and tangy capers. The noodles were cooked “al dente” – just the way it should be. Sure enough, the meal was a pleasant delight to the palate. We were, however, quite disappointed when our Letterman Mushroom Pizza was served. As a paying customer, you’d naturally expect your money’s worth especially when dining in a posh establishment such as “Marciano’s”. Their menu was fully illustrated and showcased most of their mouth-watering dishes through images/pictures. We ordered the “Letterman” based hugely on how the pizza looked on the menu’s image of it – loads and loads of mushroom covering the entire surface of the dish. When the food arrived, it looked nothing like the image deliciously depicted on their menu – bits of pathetic, shriveled-up mushrooms sparsely scattered on the pizza. In fact, there were even a few slices where you could hardly find a speck of mushroom. No exaggeration! What a disappointment. Personally, I think it’s a bad move to showcase images of your dishes on the menu if the actual food that is served hugely pales in comparison to it. Too bad I wasn’t able to snap a pic of the pizza. We complained to the waitress about it and, in all fairness to Marciano’s, they hastily replaced the pizza with one that was a better approximate of its menu counterpart. Although Marciano’s did not even contest our complaint and was quick enough to acknowledge and rectify the obvious, it should not have even come to that had their cooks/chefs (and management) been truthful to their menu. As we were getting ready to leave, the waitress handed over our bill and we paid accordingly. But when the server returned to give our change, it was surprisingly the wrong amount and the wrong receipt! It actually belonged to the table right next to us. Had we not been attentive enough, we would have just bolted out of the place with whatever change was given to us. Upon complaining yet again… a different server approached, apologized, went back to the cashier to verify our bill, and after much ado, finally returned to us with the correct receipt and change! Tsk! Tsk! 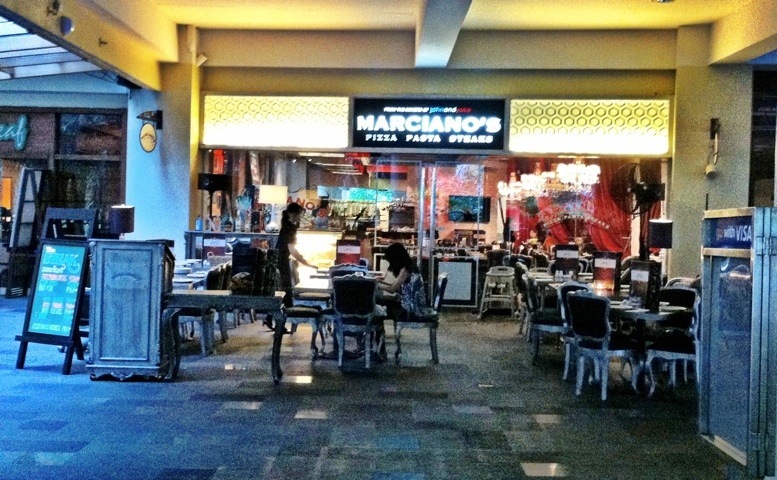 Marciano’s service was generally a failure during our visit. I hope you don’t encounter the same experience as ours during yours. Oh… and never forget to always check your change and receipt upon billing out. Cheers!